Test plate for agricultural vehicles issued after 1994. Test plate for work vehicles. Test plate and plate for trailer of the Police. Trailer plate of the Esercito Italiano issued after 1996. 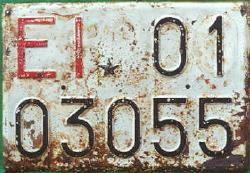 Motorcycle plate of the Esercito Italiano issued before 1968. Test plate of the Esercito Italiano issued after 2001. Provisional plate issued between 1928 and 1933. Italian UN and UNT plates used for the United Nations. Plate with the print SOMALIA used during the Italian administration in the '50s. A lot of old plates used before the Second World war (UNPA, MVSN, ...). Plate of motorbike from San Marino issued between 1987 and 1994. A lot of pictures from San Marino! Pictures of the provinces that disappeared before the second world war: Castrogiovanni (CG), Fiume (FU) and Girgenti (GI). Obviously these are just some of the missing pictures, but I'm sure that there are many more that could be added to this web site. So every picture you send me will me very appreciated! Thank you very much! Guglielmo Evangelista has got a picture of a plate made of just one line, with white characters on black, with the letters TF followed by the symbol of the Association of Disabled Men and the number 0852. What is it? 1) From 1900 to 1943 Italy had the concession of the part "F" of the Chinese town of Tientsin that was split among all the main European countries, the US and the Japan: so the plate could be "Tientsin F". Anyway the symbol of the Association of Disabled Men was introduced in 1944 and it seems to be very unlikely that Italian submarines, that went to the Far East to take strategic metal and were the only link with the motherland, could bring a set of new plates in that year. 2) From 1940 to 1945, Italy occupied a small part of the French territory, from the border of Piemonte and Liguria up to Nice and it didn't have an administrative arrangement of any kind. So the plate could be "Territorio Francese" (French Territory). Anyway it's strange that none of the many French plate collectors knows such a plate. 3) At the beginning the vehicles used in the south of Libya used plates issued in any of the coastal provinces, but it's a wierd system and it's possible that some changes were made; since most of the people and the few civil structures were placed in the area named Fezzan, it's likely that the plate means "Territorio del Fezzan" (Territory of Fezzan). Moreover this was the original name of the area, also in French after that France took the control of it in 1943 up tp 1950. There are some more doubts: the zero in first position and the format on just one line. For the first one, the same happened also in Rhodes, so it is not so strange. For the second, this format could be used for uniformity with the previous plates used, in China or in France or in its colonies. 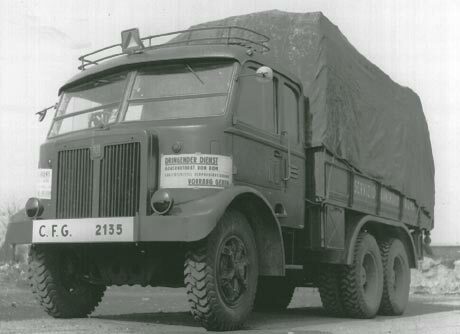 Marco De Dona sent me a picture taken between 1943 and 1945 where you can see a Breda B56 truck with the plate "C.F.G. 2135" in service from Rome to Milan. In the full picture (click on the small picture of the plate below to enlarge it) there are some prints in German and some others in Italian. On the front of the truck you can read "Dringender dienst" and "Vorrang geben" (respectively "urgent service" and "give top priority", in German), while on the side there is the word "Servizio" (service), but it's impossible to read more. The plate C.F.G. probably belongs to the short life of the Italian Social Republic, but the exact meaning is unknown. It's also possible, even if less likely, that it is an unknown German plate. Alessandro Libanore found these plates of the Italian Army that have a zero in first position. As you can see in the page of Esercito Italiano I don't know yet the meaning of such a digit and which vehicles it was used on. Anyone of you know something more? I found a picture, snapped in Trieste in 1946, where you can see a plate with the print "Polizia Stradale": for other details and the picture go to the section about Polizia Stradale. Please let me know what you think about this plate! Martin van der Valk sent me the picture of a couple of plates from San Marino with the colours yellow and blue, that I have never seen before. I haven't got a clue about the kind of vehicle they were used on or if they are fake. Every tip on these plates is very welcome! I'm trying to figure out what kind of plates the Carabinieri used between 1945 and 1949: in some sources I found the letters CC.RR., while the picture below, snapped by Alessandro Libanore shows a plate with just the letters CC. Have you got any idea about it? I received an email from Fabrizio Rotoloni and he wrote me about a car of 1938 that probably belonged to the Ministry of Interior and had the plate number NPE ***, where the asterisks stand for a number of three digits. This is all I know about this plate and it could even be a foreign plate, but I'm not sure about it and so I decided to add it in the page of misteries: every new detail or clue about it is very welcome! Some of the codes used after 1927 were never assigned to any province, though many of them could use these codes: for example, BE and MA (Belluno, Benevento and Bergamo for BE; Macerata, Massa Carrara and Matera for MA). Someone suggested that these codes were saved to be used for towns in the colonies (Bengasi and Massaua), but this seems to be very unlikely. Does anyone know a better explanation? Filippo Proietti told me that he saw in Rome a plate with the letters DSL in red followed by three numbers and two letters in black. I haven't got a clue what kind of plate it is (is it Italian?) and so I add it among the misteries. Guglielmo Evangelista saw a picture, taken about in 1930, where there is a Lancia armoured car of the "Milizia Volontaria di Sicurezza Nazionale" (voluntary army for national security) of Milan: the plate is clack on white with the number "A M 5". The meaning of this abbreviation is unknown (maybe Autoblindo Milizia?) and moreover it seems that the MVSN had never any Lancia vehicle. Marcello Taverna sent a picture taken in Sanremo in 1913 where you can see a plate with two lines, but it's completely unreadable. The strange thing in the picture is the oval "C" placed on the left of the plate. It's very unlikely that it may mean Cuba and someone suggested that it may stand for "Console". Any other idea?